Proto-oncoprotein c-Jun is a transcription factor that recognizes and binds to the enhancer heptamer motif 5'-TGA[CG]TCA-3'. c-JUN promotes activity of NR5A1 when phosphorylated by HIPK3 leading to increased steroidogenic gene expression upon cAMP signaling pathway stimulation. 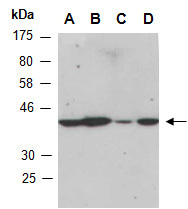 Rabbit polyclonal antibodies were produced by immunizing animals with a GST-fusion protein containing the C-terminal region of human c-JUN. Antibodies were purified by affinity purification using immunogen. (R2123-2) at RT for 2 h.